South Tottenham station is served by the Gospel Oak – Barking branch of the London Overground, providing regular trains to Upper Holloway, Crouch Hill, Green Lanes and Leytonstone. To relieve congestion, there is currently an additional train every morning which runs through to Hampstead Heath instead of Gospel Oak. National Rail provide a useful page of live departures from South Tottenham. TfL provide a full timetable for the Gospel Oak – Barking line. South Tottenham station is on Tottenham High Road, and the postcode is N15 6UJ. The station is on a Red Route and there is no parking. It is a short walk (3 mins) from South Tottenham to Seven Sisters station, for the Victoria line or national rail services. The National Rail timetable considers this to be an official “out-of-station interchange”. This means that South Tottenham and Seven Sisters are deemed close enough to allow interchange between them. If your journey passes through one to catch a connection at the other, it still counts as only one journey – so long as you take no longer than 20 minutes between tapping out at one and back in at the other. There is a bus stop just outside the station served by the 76, 149, 243, 318, 349 and 476 buses. South Tottenham station is well served for local food and drink. Turning left out of the station brings you within a minute to the Dutch House pub, a corner shop, a newsagent and a café. Just beyond these is the longstanding vegan and vegetarian takeaway, Ital N Vital, while a minute further up the road are convenience stores and a patisserie for snacks. Turning right from the station brings you to Seven Sisters junction with its Latin America café and market, and a large Tesco. Currently the only way to access the platforms and trains is via a staircase. However the station is being redeveloped to provide lifts, improving accessibility. There are no toilets, accessible or otherwise. The station has a long history, having been first opened as ‘Tottenham and Stamford Hill’ in 1871 as part of the Tottenham and Hampstead Junction Railway. However, it has held its current name of South Tottenham for over 100 years. Flickr has some interesting photos of South Tottenham Station in the 1960s. One of the adjoining original station buildings is now La Fonda De Maria, a Colombian restaurant. 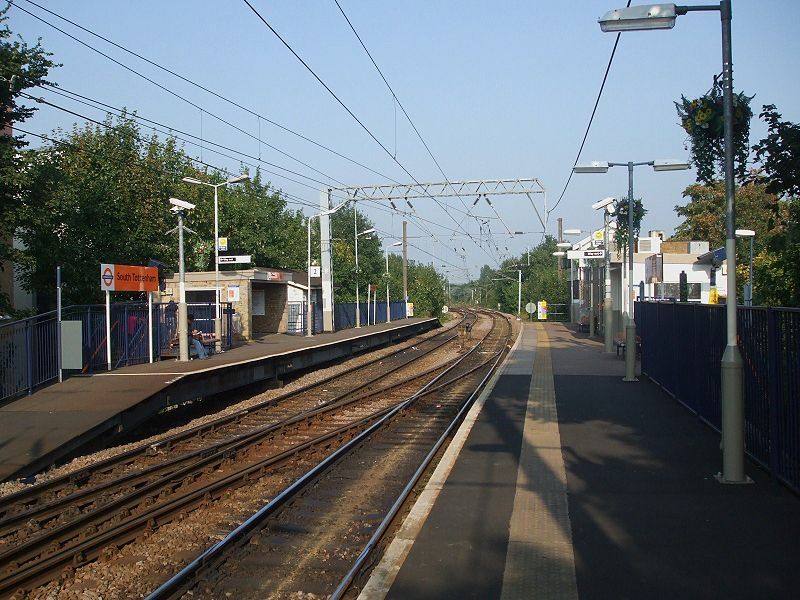 The station has received much-needed investment and improved train services over recent years, having become part of the London Overground run by Transport for London. The station is now staffed, with attendants usually on the platform itself or in the cabin at the street entrance. According to the Office of Rail Regulation, these improvements lead to a 10-fold increase in use between 2005 and 2011. There has been much talk about electrifying the Gospel Oak – Barking line. It is generally agreed to be a good idea, the problem is paying for it. In the meantime, the comparatively new diesel trains are well used, in line with the massive increase of use of London Overground now the service is improved and more frequent. At the very least, the existing trains may have extra carriages added in the next few years to cope with demand. South Tottenham station itself is earmarked for platform expansion and further modernisation. The Barking – Gospel Oak Line User Group keep track of the latest developments. South Tottenham station sits in an interesting position in terms of the rail tracks, sitting on a section joining two main lines. Just west of the station, a single turnout runs towards Seven Sisters while just to the east, there is a turnout to the north-south Lea Valley Lines. These are mostly used by freight trains or trains “on diversion”, but could provide interesting possibilities for passenger expansion in the future. Pingback: South Tottenham station changes: what do you think?